Looking for the perfect floor sofa? Let us help you with that. We’ve made a list of the top 10 best rated floor sofas in 2019 for you to choose from. A floor sofa comes in handy whenever you have a small space but need extra seating or sleeping area. It’s also a great lounge option to relax in when watching TV or playing video games. Kids love to play on the floor too, so it’s an excellent option for them to enjoy. Let’s not forget the decor value too. You don’t want to mess it up with an odd piece of furniture. So your new floor sofa has to fit in your interior as well. That’s one of the many criteria that we’ve covered by picking the best sofas. This list is not ranked, although more popular options are at the top. We’ve tried to find and examine floor sofas for different needs so that you have something to choose from. Check it out. This floor sofa is excellent if you need something small but sturdy. You’ll add extra seating to your living room, and the couch can also fold out into a sleeper. When not used, you can put it away as it’s very lightweight. 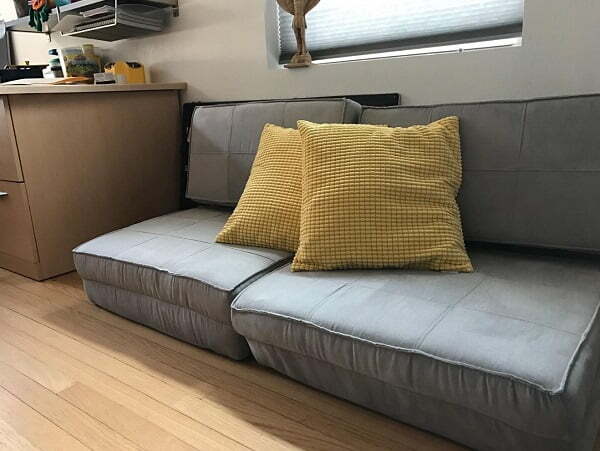 The sofa has an internal steel frame for durability. It’s stuffed with foam and upholstered with PU leather, which makes it easy to clean. All in all, it’s a very versatile piece of furniture perfect for small spaces. Why it’s our pick? It’s a high-quality product fit for small spaces as well as big rooms. With great customer reviews, it’s a sensible choice. Available on Amazon. This small modern floor sofa fits for many needs. 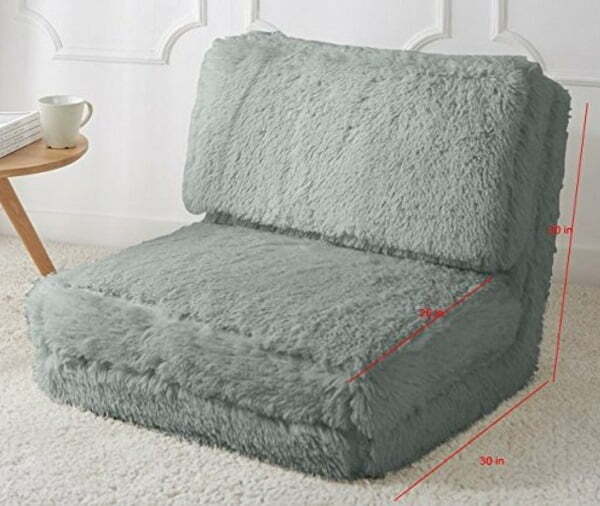 If you have limited space where seating (or even sleeping area is needed), you’ve found an excellent affordable option. 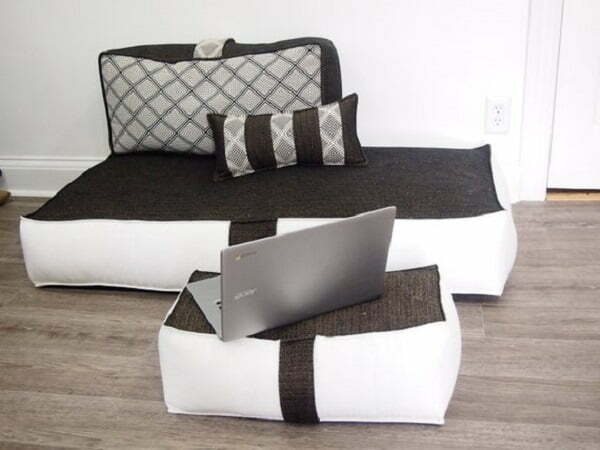 You can use it just about anywhere, from the living room to bedroom, to a dorm room or even a balcony. The sofa folds easily and has several setup options (5 levels). The upholstering is made of soft fabric which is comfortable and easy to clean. The design is slick modern, a great fit in any contemporary decor. Why it’s our pick? It’s a comfortable modern floor sofa, lounger, sleeper. It’s also Amazon’s choice with mainly nice reviews. Available on Amazon. The Harper & Bright Designs floor sofa will give your small living room a facelift as well as extra comfortable seating. 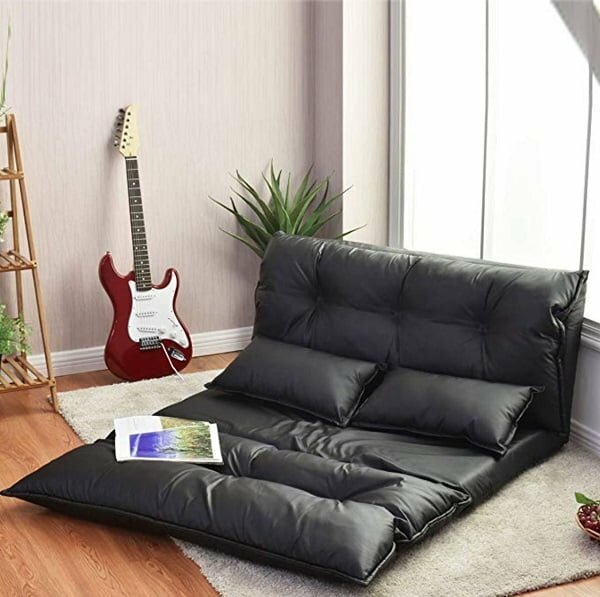 It’s a comfortable lounger with cushions that can be transformed into a sleeper when needed. It has five adjustable positions to work for all purposes, from watching tv to playing video games or just chilling out. The soft suede fabric of this sofa is comfortable and easy to clean. Although you won’t bring it outside unless temporarily during great weather. Otherwise, it’s lightweight enough to be carried around the house. Why it’s our pick? The design style wins it. And the extra cushions is a nice icing on the cake. It’s available on Amazon. This handcrafted floor sofa gives you more flexibility than any other on the list. Due to its modular nature, you can choose the segments you like and build the perfect floor sofa that you need. Hence, you will be able to place it anywhere you want. You have a choice of cushions, poofs and throw pillows. You can also choose from several fabric options. And because it’s a handmade item on Etsy, you can request a custom order too. Why it’s our pick? It’s a high-quality versatile handmade product. We like the customization options. It’s available on Etsy. Looking for something unique for your home decor? This floor sofa will undoubtedly make a great conversation piece. It’s perfect if you want to add some boho accents to your interior. As a sofa, it’s comfortable and well made. It’s a handmade item upholstered in cotton fabric. The design follows the Arabic style in traditional kilim patterns. The sofa can be adjusted to a lounger. It comes in 5 separate pieces – the floor seating, backrest, and armrest pillows. Why it’s our pick? We like diversity and choice in style. 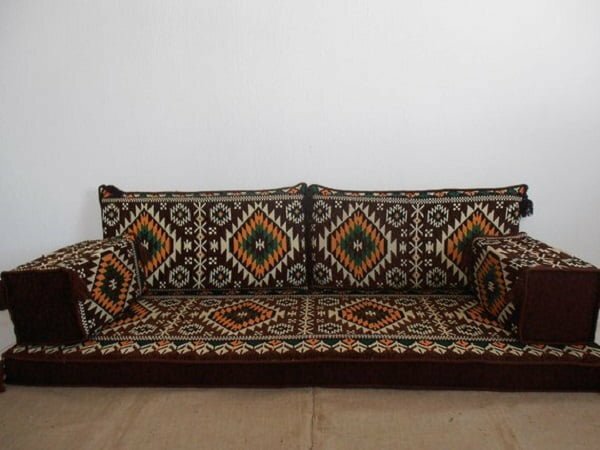 This floor sofa will add some eclectic boho decor to your home. Available on Etsy. 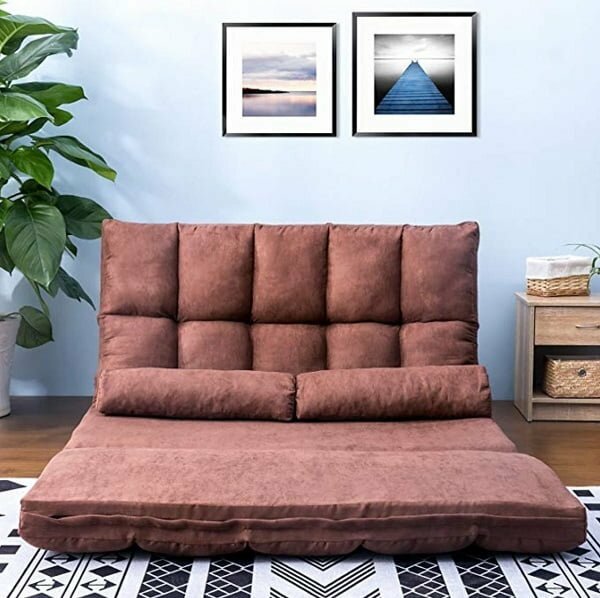 Well, it’s not an actual floor sofa but French this mattress cushion can quickly be turned into one by adding backrest throw pillows. 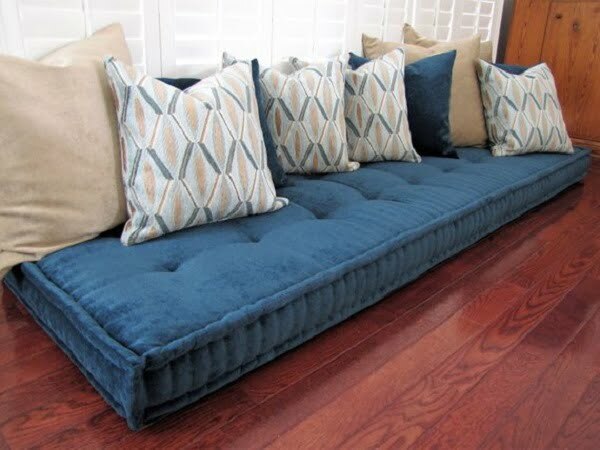 The quality of this handmade product upholstered in velvet fabric is what makes it worth it. Because it’s so simple (it’s a mattress), you can use it anywhere. It will always look good together with some throw pillows of your choice. It can easily be a conversation piece too. All in all, it’s a great choice if you need some very simple floor seating (or sleeping space). Why it’s our pick? It’s a high-quality handmade product. Velvet looks luxurious and certainly is comfortable. The item is available on Etsy. 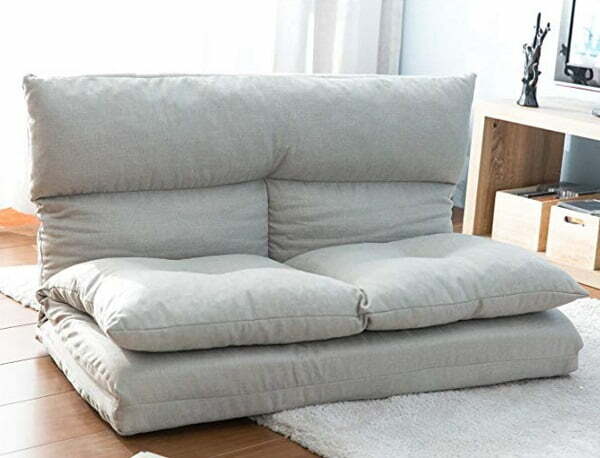 This small floor sofa is suitable for one adult, so it’s more a lounger than an actual couch. But if you need just some space to chill out in, read a book or watch TV in minimal space, this is perfect. The comfortable design and style will make you fall in love with it. We were looking for Japanese style floor sofas, and this is one of the closest available options. Albeit it’s tiny, the design makes up for it. The upholstery fabric is soft coral fleece, and the filling is very plush. The frame has five adjustable positions. Why it’s our pick? It’s a great space saver in an attractive modern design. It has great customer reviews. Available on Amazon. We realize that you may need more options for tiny spaces, so we’ve added another option that is more of a chair than a sofa. Since a small piece of furniture will fit one adult only anyway you may want to choose a lounger chair anyway. The faux fur design is a lovely decorative accent. It’s a well-designed product that’s multi-functional, lightweight and versatile. So you’ll be able to place it or move it anywhere around the house. Why it’s our pick? We like to have different style choices for home decor. The faux fur look is a classy accent that your home may need. Available on Amazon. We wanted to add something very compact and mobile to this list. Something that you’d be able to take with you in a car, easily move it around and use it as seating or sleeping space anywhere you need. This floor lounger is that kind of product. The only caveat is that the fabric is not waterproof, so you’ll be able to use it outside only during good weather. Otherwise, it’s a great mobile lounger, bed, sofa, chair, or even a workstation. Why it’s our pick? It’s very compact and mobile. An excellent choice for someone on the move. It’s available on Amazon. Anything floor seating related has to include bean bags. They’re perfect when you need something relaxed and don’t mind much about decor value. 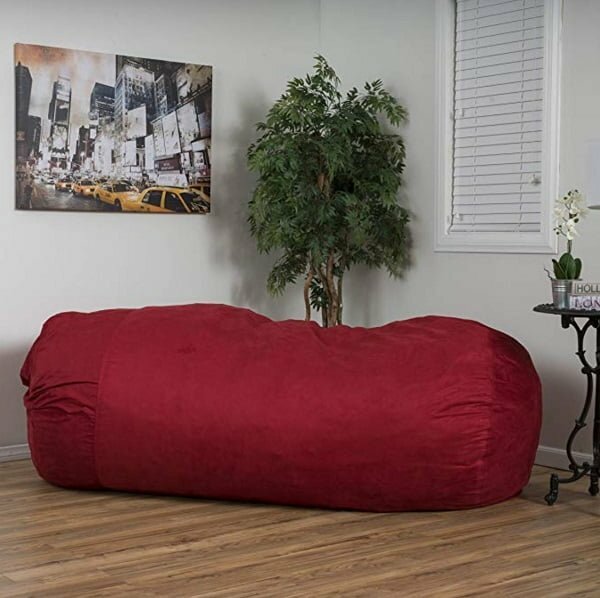 Especially when you can get something as big as a floor sofa size bean bag. 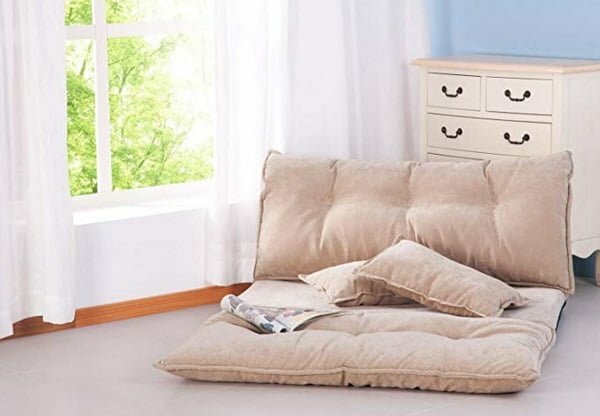 So this is your regular bean bag that’s large enough to work as a small sofa. It will give you some extra seating space and will be comfortable enough to chill out in. Everything else is as much as you’d expect from this type of furniture. Why it’s our pick? It’s a decent large bean bag with high customer ratings. And it works as a floor sofa. Available on Amazon.